Barcelona is the second largest country in Spain, and acts as the capital of the autonomous community of Catalonia. It is located on the coast of the Mediterranean Sea between the mouths of the rivers Llobregat and Besòs, and is the largest metropolis on the coast. The city is European Union’s sixth-most populous urban area, with a population of approximately 1.62 million within its administrative limits. However, the urban area of Barcelona extends beyond the administrative city limits with a population of around 4.5 million. Barcelona was originally founded as a Roman City before becoming the capital of the County of Barcelona. 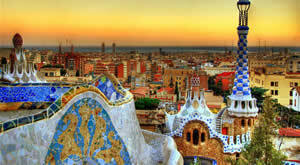 Barcelona has a rich cultural heritage and has today become an important cultural centre and a major tourist destination. It is well known for the architectural works of Antoni Gaudí and Lluís Domènech i Montaner. These sites have been designated UNESCO World Heritage Sites. The city is also known as an economic, trade fair/exhibitions and cultural-sports center, as well as an important player in commerce, education, entertainment, media, fashion, science, and the arts.